Please join us for another evening of style and elegance, as we celebrate our 26th Annual “A Night of Jazz and R&B” event. This year our Soaring Eagle Award Honoree is Ms. Sybil Wilkes, Co-host Tom Joyner Morning Show. 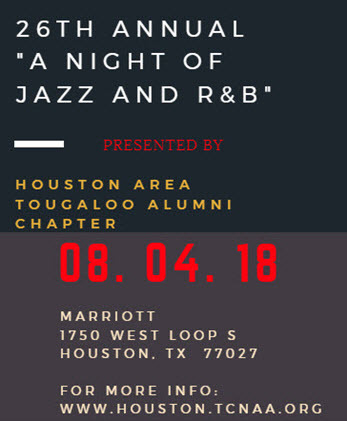 Come dressed to impress, as we jazz things up with a “Harlem Nights” theme. Pull out your shimmy dresses, feathers, top hats and suspenders and let’s make this event a success! NOTE: Submit camera ready artwork via email to tougaloohouston@gmail.com by July 15, 2018.